This is some awesome news, particularly for all the people fleeing Medium. Now they can own their own data on their own domain a whole lot easier. I wouldn’t be surprised to see more of the #DoOO crowd joining Micro.blog as an option too. I’ve been writing on Medium for three and a half years. Some of these reasons are very pragmatic for everyone, but he’s also got some business specific ones that touch on things many small businesses would want control over as well. He additionally points out some very subtle changes in media for people who are reaching out to niche audiences. Some of this is reminiscent to things Leo Laporte has spoken about in the past with respect to leaving television and cable to start a podcast network, except in that case there really wasn’t a huge amount of competing media, so instead of moving to silos (which didn’t exist at the time for his use case) he went straight to using his own platform. Ending my experiment with blogging more on Medium. Typically in my experience, a freestanding “m” subdomain is often used to host and indicate the mobile version of a website. I’ve just noticed that the URL design of Signal v. Noise instead uses their https://m.signalvnoise.com subdomain to presumably indicate “Medium”, the social silo that hosts their content. TK is an abbreviated editorial mark made when writing, proofreading, or editing to indicate that a portion of the piece is to come some time in the future. Writers often use the combination when writing so as not to slow down the flow of their thought when they might otherwise need to look something up or do some research. Because the letter combination TK is very rare in the English language it is easy to do a search or search/replace for the mark in digital documents. When composing text in Medium if one writes a stand alone TK within the text, the text editor shows a yellow TK within the margin as an indicator to return to that place to finish the thought(s). Example of a TK editorial mark in the Medium.com user interface. The amount of work required to support this feature should be exceedingly low. It’s probably a good indication that Medium won’t be around within a year or so. This definitely signals the fact that Medium has moved toward the more silo end of the spectrum from a data ownership standpoint. While I might have recommended it with reservations as a potential IndieWeb solution, this change means I can’t recommend it at all. A friend pointed me to a story on Medium called “Death to Type­writ­ers,” by Medium de­signer Marcin Wichary. 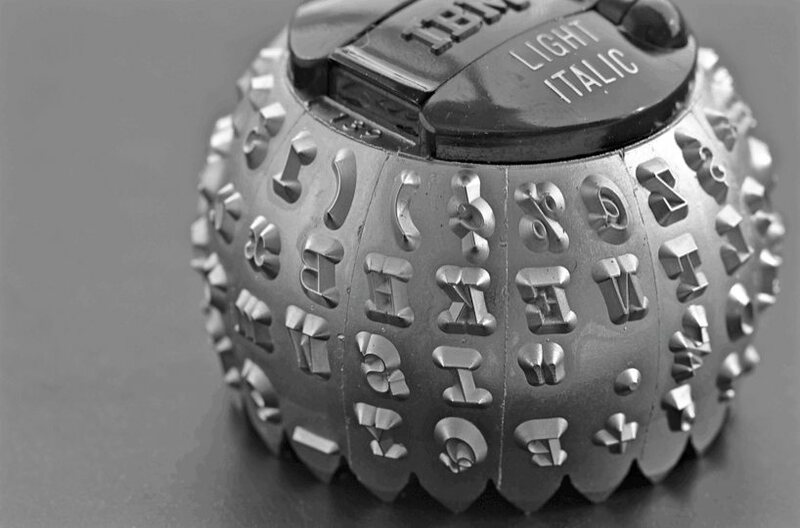 The story is about the in­flu­ence of the type­writer on dig­i­tal type­set­ting. It ref­er­ences my “ex­cel­lent list” of type­writer habits. This also sounds like a great way to cook! You’re definitely not owning your own data. Where to publish something has becoming a difficult decision for a lot of businesses. You read so many stories about using various channels to distribute content and grow traffic, it’s hard to know what does and doesn’t work. Medium, in particular, has become a major player in the world of startup content, but is it really that great? [...] The numbers just didn’t make sense. Yes, I could put more into Medium and try to build up readership even more. The guys at Basecamp regularly get 250k+ views on their content. But doing that helps Medium the most in the long run. They’ve been fumbling left and right trying to figure out how to make Medium sustainable, and I’m just not convinced they’ll always do what’s best for us and our business. Switching back Now I didn’t want to throw out distribution on Medium entirely. There can definitely be some benefit to syndicating content there. It’s essentially another distribution channel to expose people to our content. So we needed a game plan on how we could still make use of Medium as a distribution channel without cannibalizing our own readership or SEO work. This is 100% on the mark, you should definitely own your own content. Syndicating it out to Medium is a great idea, particularly when you can get a rel=”canonical” tag for the original on Medium. Incidentally Medium has their own WordPress plugin that will allow you to quickly and easily syndicate your site’s content directly to Medium without needing to separately import it. It’s also available on a per post basis. But, even with this, you’re only getting 50% of the value of having your own website because you’ve only got one way communication out. Next you’ll need communication back in. What if I said you could get a lot of the comments, likes, and interactions from those other silos back into your website too? This way the conversations others are having relating to your content also come back to your site and enrich it there? What if you could own all (or almost all) of the conversation around your content? Think about it, what if there was an @mention functionality that worked from website to website instead of being stuck inside Twitter, Facebook, Google+, Instagram, Flickr etc.? Interestingly, it exists! And you can set it up for free with last year’s new W3C Webmention protocol which already has WordPress plugins ready to go. Roughly for WordPress you’ll need the Webmentions plugin, the Semantic Linkbacks plugin, the Syndication Links plugin, a few strategically placed rel=”me” tags on your site, (maybe some tweaks to your microformats on your theme), and a free Brid.gy account. Details for setting it up can be found on the WordPress pages of the indieweb.org website. I suspect if you’re strong enough to have figured out the tech for your article, you could probably have it up and running in under an hour or so. Then instead of feeding content from your blog to the black hole of social media, you could have actual two-way communication with many social silos! Now you won’t need to pay as much attention to those other sites as you can use your WordPress site as an “app” to interact with them instead. I’m happy to help walk you through it if you’re interested and need help. My own personal site has some documentation of some of the above as well as examples of how it works. How to leverage your own site and Medium without duplicate content issues. Today’s web is very different from what it was 8 years ago. We’ve said it several times: publishing and consuming content are new frontiers for most of the web giants like Facebook, Google or Apple. We consume the web from mobile devices, we discover content on silo-ed social networks and, more importantly, the base metaphor for the web is shifting from “space” to “time”. Superfeedr, the open web’s leading feed API and PubSubHubbub hub has been an independent player for 8 years. Superfeedr exists in order to enable people to exchange information on the web more freely and easily. Today, we’re excited to announce Superfeedr has been acquired by Medium. In many ways, it’s a very natural fit: Medium wants to create the best place to publish, distribute and consume content on the web. Together, we are hoping to keep Medium the company a leader in good industry practices, and Medium the network a place where this conversation can gain even more traction. I consider myself a member of the open web community and very friendly with the goals of the IndieWeb community. I too wish for a world where web giants have less power and where the user is in control of more of their data. Yet, I now work for a large (the largest?) publishing platform. It is not often easy to reconcile, but one thing that I can tell you for a fact is that your data is, on average, safer on large hosting provider than it is on your small indie site. I’d be curious to see more concrete numbers on these statistics, though I suspect that for “mature” sites, it may actually be the case. Some of the small, middling platforms however… The other side of the coin though is that when airplanes do crash, the death toll is seemingly large, and this is also the case with major silos. While he mentions personal sites disappearing, it’s typically something that the site owner can often at least make a conscious choice to do and they can also mothball the data for later use. With a silo death, they really have no choice and often can’t get any data at all. I hope that perhaps Medium opens up in the future to do some of the functionality that he mentions. Where we’re going Though we’ve been working on this set of problems since the beginning, this year Medium took a big step toward a new solution. Our subscription strategy is based on a simple idea: By charging readers directly, we can make the experience and the content better, which creates a no-brainer proposition for anyone who values their time. By eschewing ads, we remove conflicts between serving our readers and serving those paying the bills. And while many publishers are looking towards subscriptions as an alternative to the deleterious effects of ads (a move we support for everyone), Medium is the only “open paywall” for thoughtful content on the internet. Which means, we tap into the ideas and expertise of thousands of the smartest minds on the planet — many of whom made Medium what it is today — to bring fresh perspectives to Medium members. And starting today, anyone can enroll in our Partner Program and earn money based on the depth and value they provide to members, not the fleeting attention they deliver to advertisers. Along with that, we add stories from the world’s best publishers and seamlessly combine it all in an ad-free, personalized experience. The end goal is to offer the world’s best source for important stories and ideas.